NEW! 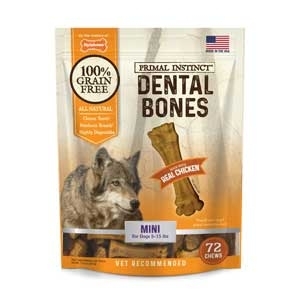 Made with real chicken, these all-natural, highly digestible dental treats satisfy your dog's primal instinct to chew. They’re purposefully crafted to help clean teeth and freshen breath by engaging your dog's natural chewing action. Plus, each wholesome chew treat is 100% grain-free with no wheat, no meat by-products, and no corn.